HYDERABAD: Has Indian writing in English come of age? Okay, we can write romances and mysteries. But can the Indian English writer also write a sci-fi novel with a mythological spin? One that is unputdownable? 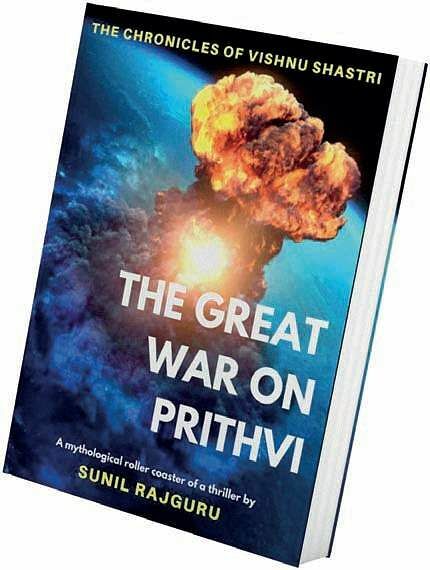 Debut writer Sunil Rajguru’s book ‘The Great War on Prithvi’ answers that in the affirmative. A mythological thriller, this is his first published book, under the series ‘The Chronicles of Vishnu Shastri’. It’s about a 16-year-old caught in a parallel world of Mahabharat style astras. The 320-page paperback (PK Enterprises, `400, available on Amazon) begins on a rather dramatic note. ‘The heavens announce my arrival’ reads the chapter one and the first couple of pages describe a typical Indian scenario of an expectant mom on the verge of labour, a harried family, waterlogging on the roads on that monsoon night in middleclass India… The drama continues into the pages. The story goes in a first person, from Vishnu, the protagonist’s point of view. We are told there is going to be more drama when the astrologer is unable to figure out something drastic in his horoscope due to the presence of a comet in his astral charts. Vishnu is an eccentric character, the kind who writes great answers in his exams, but writes just enough to pass. The kind who likes to meditate soon after he finishes writing those mandatory answers. Well, the same eccentric behaviour continues and we are treated to some really good insights into the kind of person he is. The spacing of the sentences in the pages actually quickens the pace of the reading. Short, sharp sentences. All statements. Almost like in bullet point style. That’s when you start enjoying the read. By now you know, Vishnu Shastri is no ordinary Shastri and that we should brace for a lot of action. The story is about the 16-year-old Vishnu Shastri finds himself pulled into a parallel world called Prithvi, which is similar to Earth with a different timeline. There is no sign of religion or science there, but he discovers fantastic astras that are virtual supernukes and can control the weather and all of Prithvi’s elements and unleash untold destruction. Vishnu meets an ageless, mysterious astra expert, who throws up more questions than answers. He has to escape the beautiful, evil and demented Shakti, Prithvi’s foremost assassin who is out to get him.The book is definitely a roller coaster ride full of twists and turn.Sunil’s racy writing keeps you glued. An enjoyable read!